DGenetics Musics is like that band you started in high school. First you find a name. Then you make tshirts, stickers, liner notes and rave cards. Then you pick up the instruments and hope everyone can jam. The good news is, Old Gold, Fiore, Pumpkin Patch and DGenetics have been creating remarkable art long before they became the latest music collective to forge their way into the internet bloodstream. The grass roots indie artist revolutionized the way musicians interact with their audience. Bypassing the MTV board room executive, the modern artist is a ninja-assassin, social networking music machine. Artists like the UK's Little Boots have built devoted fan bases and careers via free marathon mixtapes and home video cover tracks before ever recording a studio album. DGenetics Musics pairs these skills with a killer musical instinct. They approach their craft with a devotion to fun, creativity and collaboration. They are a do it yourself record label that gains new skills and artistic contacts out of necessity. While DGenetics has mastered the modern modes of distribution, what is most inspiring is that at their very core is the desire to create remarkable art. Now that they've fully developed their brand and rooted their infrastructure in the sunny hills of LA, DGenetics Musics is ready to focus on the music again. 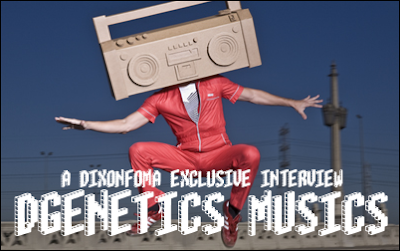 I had the chance to speak with the infamous boom-box-for-a-head leader himself, DGenetics, about remarkable art, musical influences, who his new favorite band is and the success of the DGenetics brand. How did Old Gold, Fiore, Pumpkin Patch and DGenetics meet and begin collaborating? I met Old Gold at a party in North Carolina, when I was recording the Dgenerate Nation album. He was friends with one of the rappers I was working with on that album, and we started hanging out and collaborating on a few songs. Fiore is my younger cousin, and we've been close since he was born. We've had fun making music together during holidays since he was about 8 years old. Pumpkin Patch is a childhood friend. I was in a band with his older brother throughout high school, but I've known him since he was probably 3 or 4 years old. I assembled the group together under the Dgenetics Musics label two years ago. Why have a group of East Coast jammers relocated to Los Angeles to pursue their musical aspirations? What makes the LA scene fertile ground for superheroes? That's just the way it worked out (although Pumpkin Patch is in NYC, while the rest of us are in LA). When I founded the label, I decided that I needed an environment where I could build a strong network in the entertainment and arts world. I had lived in LA before, had good friends there, and my girlfriend had just moved to San Diego. So, I moved to LA. After about a year, Old Gold and Fiore came out as well. It's great to have those guys out here to work with, but it also works well to have Pumpkin in NYC so we can maintain that bicoastal action. LA is cool, but I don't think our powers are limited to southern California. Dgenetics Musics is a comprehensive brand of character driven media. Why create this unique branded universe to market your musics? Why has your brand been so successful? Our brand is what I think a brand should be - it's just an extension of our tastes, our personalities, and the way we express ourselves. We built the label from scratch and without funding, so we've had to do almost everything ourselves. When we wanted press photos, we didn't have a professional photographer directing us and a stylist doing hair and wardrobe. When we needed a logo, I taught myself Adobe Illustrator and designed one. When we needed a website, I taught myself CSS and HTML, Old Gold helped me design the site, and I built it. We didn't set out to create our brand as it is. Our brand developed through our ideas and our personalities building on themselves. I think people are getting behind us because we're expressing ourselves honestly and without restraint. And because we have fun. What are the advantages of the do-it-yourself record label? How do you strike a balance between solo and group goals? As I said above, being DIY means that everything about our label has our signature feel to it. It also means that we don't have to answer to anyone, so we're free to make our own decisions about what art to create, which projects to take on, when to release our work, etc. We're still very young as a label, and right now our goals are pretty in sync. But, we just try to communicate openly and work towards compromise when necessary. Your stellar videos directed by Drew Innis and hand silkscreened tees by Boone Hammarley suggest DGenetics is the product of the kindness and talents of friends. What kind of a creative environment is DGenetics Musics? Both Drew and Boone have actually become our friends as a result of our work. Drew and I share a very close mutual friend who suggested we work together on the Skate With Me video. We basically lived together for two weeks while we filmed the video, and we became good friends and mutual fans in the process. When we needed someone to silkscreen our t-shirts, my friend Kristin - who runs the Apartment 3 clothing store in LA - put me in touch with Boone. He turned out to be a really awesome guy, so we became friends pretty quickly. Similarly, we needed someone to handle the animations in the Gen V video, and just when we were starting the editing process I ran into a high school acquaintance who had recently graduated from Art Center in Pasadena and was part of a startup motion graphics collective called BORN (http://weareborn.tv). I met with him and a few of the other guys in BORN to discuss the project, and it turned out that they were already fans of the Skate With Me video and became really excited about the Gen V project. So, the label is kind of a product of the kindness and talents of friends, but it's also been kind of a platform for bringing together artists and for developing friendly working relationships. Hopefully, that's a reflection of the creative environment surrounding the label. In the internet music landscape, does the artist have to connect with their audience on a more personal and socially networked level to be heard? To be heard, I think the artist needs to make remarkable art and make it as easy as possible for the audience to share it. I'm not sure how important it is for the artist to have a more personal connection with the audience, but I think it can be rewarding. Does this suggest the artist has reclaimed the game from the record executive? Can you bypass MTV and still be a success? Well, I haven't really checked in several years, but I'm pretty sure MTV has little to do with music. Artists can definitely be successful outside of mainstream media. If an artist makes remarkable music (music that inspires people to share it or talk about it), releases it to the Internet in a way that people can find it and share it easily, and establishes some method for collecting new fans into a mail list, he or she will start to build a growing distribution network for future productions. Any exposure can help the artist to grow this distribution network over time, and the artist will be able to release new work to a bigger and bigger audience. It doesn't have to be network television or Clear Channel radio. The Generation V sampler includes as many genres and sounds as it has tracks. Who are the groups musical influences? Bjork, Bowie, Can, Captain Beefheart, Chopin, Discord, Faust, Genesis, George Harrison, Giorgio Moroder, Motown, Patrice Rushen, Pretty Tony, Quincy Jones, Rachmaninov, Thelonious Monk, Wu-Tang. What inspired the DGenerate Nation hip hop experiment? Dgenerate Nation actually came before Dgenetics Musics. While I was in charge of recording sound and composing music for an independent film production company in North Carolina, I met some local rappers and started producing beats for them. Eventually, I brought them together to record the Dgenerate Nation album. A record label in NYC wanted to sign Dgenerate Nation, but I didn't like the contract. So, I founded Dgenetics Musics. Who is your new favorite band? I've really been enjoying Pnau and Empire of the Sun. Both are projects from Australian singer and producer Nick Littlemore. Great questions, Dixon. I think your blog is gonna be very successful. Keep in touch! I love the fact that they have Wu Tang as one of their influences. Your questions outclass a large amount of various other questions I've heard asked in interviews. I like how Captain Beefheart is among the favorite bands list. "Most people like cupcakes better, I for one care less for them!" It was such a great experience. Discovery on Saturday. Interview on Monday. The internet moves fast. I should also mention that I totally underestimated these guys when I first started listening. I thought they got ahead of themselves in creating such a colourful brand before they had nailed down the music. The truth is, they are in pursuit of remarkable art before all else. Hopefully more interviews to come. UPDATE STATION: TWO INTERVIEWS PENDING. You've given an interview that matters, an interview about art and inspiration. Like Dgenerate's style this interview is outside the normal conventions of the ring of celebrity pomp based on pop-culture trends and hit a chord that resonates.